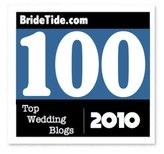 2) Your least favoritest thing about wedding blogs. You can enter once until January 25, 2010 11:59 EST and a winner will be chosen at random. Feel free to elaborate or vent on any of the two above too, I'd love to get an idea of what is useful for brides today who are reading today's blogs. Make sure you leave a way for me to contact you if you are the winner! Make sure that you subscribe to my blog, or my Facebook Fan Page or my Twitter to stay on top of who the winner will be and feel free to pass it on. favorite: the pictures of everything. As for blogs, I absolutely love all the beautiful pics and great diy ideas. I love ladies sharing about their personal experiences and strategies in the planning process... and the relational process of engagement. I don't enjoy seeing people just copy other people's blog posts (unless they expand on them with their own thoughts and ideas). least favorite: seeing amazing diy projects and knowing they would never look as good when I try. Favorite: So many DIY projects that make me feel like I can tackle them. Least favorite: The DIY projects that make it look so dang easy and cheap when it's really not. So, I love getting ideas from other people's wedding blogs and reading their "stories." Did I mention that this is a fabulous giveaway? I love all the inspiration and creative people you find. I don't like the fact that I can't read all of the great blogs out there (too many). favoritest: all the unique ideas i wish i would come up with! Favorite thing: That I get awesome ideas I never would have thought of myself. And all the stunning pictures of EVERYTHING! Favorite - the sense of community and free-sharing of ideas. I love how open everyone is with what they are doing, and how so many people share the steps for their DIYs. Least fave: the repetition. If I see something in one place, I don't want to see the same description on ten other blogs (I do a lot of reading). Just link back that you liked what someone did, and if I have already seen it, it's a lot easier to skip. Favorite thing about wedding blogs: The camaraderie that occurs between blogging brides. I love the support/advice/opinions that I get! Least Favorite: The feeling of need to "keep up with the Joneses" so to say. My least favorite thing: The great ideas! haha. I want to incorporate just about everything I see! 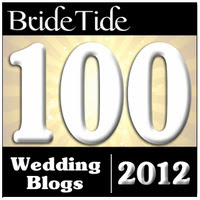 Fave thing about blogs: The support and feedback from fellow brides about all things wedding. I love having a place to constantly (read: obsessively) talk about weddings and not feel guilty about it. Least fave: Blogs that don't leave a lot of pictures. Being that you rarely meet these people in person, one of the best ways to feel like you really 'know' them is through all the visual images you can share online to help bring your readers in. 1. I love learning all the new ideas/details brides are incorporating into their big day! 2. i like blogs that have pictures..if an entry doesn't have at least 1 pic.. im bummed..and hard to read the entry! I love all of the inspiration I get, it's so helpful! What I don't like is when bloggers only write and don't include pictures... keeps you interested and gives you a visual! I've heard so much about Miss Now Mrs and would LOVE this giveaway! My favorite part - besides inspiration from photos, b/c I think that's almost a given - is etiquette advice and how-tos on problem solving. I'm a fixer, not a freaker-outer. My least favorite part - overindulgent brides. I'm interested in reading how a bridge overcame something or what WORKED, but not every single tiny detail. What a fun giveaway! I could use this :) My favorite thing about wedding blogs is the many, many inspiring ideas and all the support and kind feedback you receive from others! My most un-favorite thing is when you comment on someone's blog on a pretty regular basis and they never visit your blog. #1 MY FAVE thing about wedding blogs- the EXTREMELY tight bond that women-who have never met-can have while discussing budgets, flowers, inspirations & dresses. I LOVE the free flow of ideas & support that comes from blogs. It's kinda like "we're in this together, honey!". #2 My LEAST FAVE thing about wedding blogs- Hmmm...that I can't sign up for them quick enough? No? Okay...when some bloggers are overly critical of others or alway have to try and "one-up" another blogger. It's a wedding, not competition. Oh...and I hate when blogs don't have pictures. Favorite Thing: Seeing new ideas and great inspiration. Least Favorite: Lots of text, so little pictures. I read so many blogs, that it's hard to read them word for word. I usually skim them and those who have really eye catching images I'll stop and read closer. Least Favorite: the time it takes me to go through it all. my news reader always has 100+ unread items in my OMGWedding! category! My favorite thing is also my least favorite thing. The inspiration overload. In the beginning it was perfect, but as I get deeper into planning, I can't seem to draw myself away from the blogs, and I keep seeing new great ideas that I'd love to incorporate. un-favorite: that i'm not getting married now! favorite: seeing pretty, diyable things i want in my wedding! unfavorite: seeing pretty WAY TOO EXPENSIVE things i want in my wedding. My favorite part of wedding blogs: All the great ideas! All the great ideas! I have such a hard time narrowing it down to what I actually can do. My favorite and least favorite thing about wedding blogs is the same thing. Inspiration, sometimes it is amazing and the new ideas are incredible and other times it is overwhelming and you feel like you need to use all the ideas. As an oh-so-progressive Master to Mister, I nearly resent the gender bias in this contest! But seriously: it is not always the woman who changes her name (and, indeed, I did request permission from her father--first for her hand and later for her name...). The worst thing? The hysterics! Every. Last. Detail. Must. Be. Perfect! Favorite: All the wonderful, creative ideas! Favorite: The amazing inspiration ideas and pictures. Every aspect of the weddings look so well put together! Not so Favorite: That would have to be the expensiveness of the wedding elements. There's some beautiful things out there that cost a fortune! Pictures. I love love love all the pictures. I hate when there's something amazing (most often a gorgeous venue), and they don't list where the wedding was held. It's impossible to figure it out sometimes, and the not knowing drives me insane. my FAVORITE thing: all the inspiration you wonderful people provide! especially DIYs and gift ideas, etc. my least favorite - seeing the same wedding/project on multiple blogs over and over again. i like a small, "hey look at this", but not an entire feature of the same thing.